On Sunday, I attended the City Harvest Church service at Singapore Expo Hall 1. I sat with my cell group members. The service started at 10 am with beautiful Praise and and Thanksgiving and then worship led by Sun Ho. 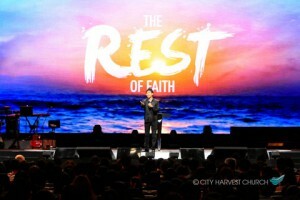 After Praise and Worship, Pastor Kong preached on “Rest of Faith“. In the Genesis 2:2, we read And on the seventh day God ended His work which He had done, and He rested on the seventh day from all His work which He had done. God rested on the seventh day after having fully completed His work. Adam was created only on the sixth and the last day of work, entering directly into the day of God’s rest. “The intention of God is clear—we are to take dominion, be fruitful and multiply, through rest in God,” declared Pastor Kong. Pastor Kong said, we are meant to lean on the authority and power of God. The key to rest is to trust in the promises of God. If we give our best, he will give us the 100 fold return. Trust is the key to entering God’s rest. In Hebrews chapter 4, we read that God wanted Israelites to conquer Canan through rest, but they panicked and didn’t trust God. Hebrews 4:2 2 For indeed the gospel was preached to us as well as to them; but the word which they heard did not profit them,[a] not being mixed with faith in those who heard it. Pastor Kong encouraged people to mix the Word of God with Faith. Trust is to rely on, to lean on, to be commited to the dreams and visions you have received from God. The Israelites were a classic example of a people whose hearts were hardened through unbelief. Though they were delivered from slavery in Egypt, they could not enter the Promised Land because they failed in their faith, continually complaining against God and Moses; each time they complained, their fear increased, and faith decreased. “Your faith is shown through the words you speak,” explained Kong. By refusing to speak positively and confess His promises, the hearts of the Israelites became hardened. God considers unbelief something evil (Heb. 3:19). In fact, the verse in the Amplified Bible states that unbelief shuts the believer out from receiving the promises of God. Kong encouraged the congregation to evaluate their own speech. By making statements such as “I just can’t believe I can be healed,” or “I just can’t believe I can be delivered from this addiction”, unbelief begins to harden the heart of the believer. “If you need a miracle, only believe!” Kong declared. Hebrews 4:10: 10 For he who has entered His rest has himself also ceased from his works as God did from His. If you trust in Him, you do not have to struggle by your own works. We must trust and obey in the leading of the Holy Spirit. Believers, therefore, are to exercise their God-given authority and dominion as children of God through prayer, praise, proclamation and prophecy. Pastor Kong mentioned we must have goals and objectives based on what God has shown us and then we plan for it. Is your future God’s future or our own? If God has given you a vision, then there will be provision. We are doing things, because we are moved by God. When we trust and obey, there is supernatural ease to which we receive miracles. Supernatural ease is the grace of God. We must Love God, enjoy His Presence, and obey His word. Hebrews 4:11: 11 Let us therefore be diligent to enter that rest, lest anyone fall according to the same example of disobedience. Pastor Kong mentioned rest of faith is not physical relaxation, we must labor to enter into that rest. The Israelites had giants to conquer in the promised land. God does not desire that believers do nothing, but that they fully rely on the power and authority of Jesus to achieve their visions and dreams. James 4:7: 7 Therefore submit to God. Resist the devil and he will flee from you. Pastor Kong said, Where there is rest of Faith there is fight of Faith. We can do that by resisting the devil, constantly praying and speaking out the Word of God. He mentioned that the real fight is whether we can have faith in God’s promises. Pastor Kong said, we must Trust, Believe and Speak. A good way in which believers can exercise resting in faith is by speaking in tongues. “When you speak in tongues, your mind is totally at rest. The Spirit is praying through you,” explained Kong. “When you pray in understanding, you have to think about how to pray and what to say. However, when you are praying in tongues, there is no stress! At the same time, you know your prayer is powerful because you are praying in the power of the Spirit,” he said. Hebrews 4:16 : 16 Let us therefore come boldly to the throne of grace, that we may obtain mercy and find grace to help in time of need. Pastor Kong said “God will not give us what we deserve, but God will give us what we don’t deserve”. God will give us Healing, Power, Anointing and His Blessings. 14 Indeed I have taken much trouble to prepare for the house of the Lord one hundred thousand talents of gold and one million talents of silver, and bronze and iron beyond measure, for it is so abundant. I have prepared timber and stone also, and you may add to them. He encouraged people to give to the works of God. When people build God’s house, God will build their house. All the people responded to the sacrificial giving and came forward with their offerings. It was a marvellous sight to see the entire congregation responding cheerfully. Later, Pastor Kong led the people into worship. He prayed for the healing, finanical miracle and deliverance for the people. The anointing of God was powerful. People prayed in tongues, held hands and prayed corporately. It was an awesome time. Finally, the service ended with beautiful praise. This entry was posted in City Harvest Church and tagged City Harvest Church, Pastor Kong Hee. Bookmark the permalink.